Do you love the outdoors? Looking for a summer adventure? Through this camp, participants will enjoy scavenger hunts, playing games, hiking, map reading and much more! Full & Half day sessions are available. Participants can also sign up for single days or the full week! Our Summer Camp encompasses games and navigational activities to ensure that all participants are engaged. To ensure participants are comfortable & secure, all activities are completed in pairs or small groups. Develop physical literacy skills through games and sport activities. Build confidence and independence while exploring nature. Pricing per child: $25 per half day, $50 per full day. Or take advantage of these discounts: $150 for full 5 day OR $75 for 5 day, half day. Siblings under 5 can attend with a parent or guardian for FREE! Have questions? 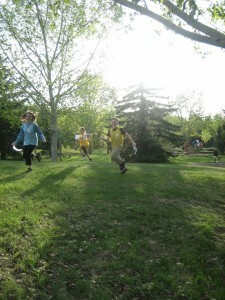 Check out our Summer Camp FAQs page or email Dorothy at kidsrunwildyeg@gmail.com.